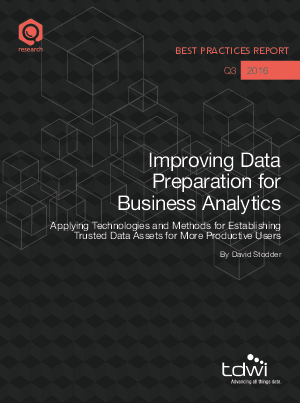 In our report, TDWI Research advises organizations to focus improvements on reducing the time it takes to prepare data, which can help users realize insights from data faster. Users are weary of long and repetitive data preparation processes. Rapidly evolving technology is enabling organizations to automate and standardize steps as well as build knowledge about the data for better reuse and sharing, transformations, and analysis. TDWI Research additionally advocates integrating data preparation with governance programs. As organizations increase self-service data use, they need to ensure that users observe good governance and support stewardship of data assets. Clearly documenting data preparation steps can be helpful in making governance more effective and giving users the confidence that they are working with trusted data in BI and analytics projects.